Easter Island has been a place of mystery for several hundred years. It is a small island in the Pacific, owned by Chili, and is remarkably isolated. It is about 14 x 9 miles in size, sits 3700 km (2220 miles) from the South American coast, 2000 km (1200 miles) from Pitcairn Island (its closest neighbor to the north which is a very minimally populated island in itself and has its own fascinating stories), and 4100 km (2460 miles) from Tahiti. It is best known for the remarkable huge carved stone statues around its coastlines. Because none of the currently existing native peoples retain knowledge of their ancestor’s religion or practices, little is known and lots is surmised about the statues and the early life on the island. In her book, The Mystery of Easter Island, published in 1919, Kathryn Routledge wrote about the archaeological work done with the team that included her and her husband and the interviews she did with the natives of the island at that time and still very little was remembered. That’s because a population of, once, 20-30,000 was reduced by in-fighting, western diseases (small pox, tuberculosis, influenza), and starvation to around 2-3,000 and survival became paramount to retaining oral history. A couple boats we know sailed to Easter Island, one on their way to French Polynesia and one on their way back to the coast of Chili from Central America. Their reports were so fascinating and compelling that we decided to visit Easter Island ourselves. By now, our boat is long past the place where prevailing winds could carry us there, and, as our friends confirmed, the island is very exposed, often windy, and anchoring there was a toss of the dice—one boat left in gale winds because there was no longer any satisfactory protection to remain anchored. So we took a plane there—as it turns out, there are two places with direct flights to Easter Island: Santiago, Chili and Papeete, Tahiti. So here we are in Tahiti, we thought, let’s go. A small side note if ever the opportunity arises to fly LAN airlines, jump at the opportunity. The service was incredible, hot “full” meals served with wine and real silverware were just part of the “standard” services offered as well as a large selection of movies and other entertainment on one’s individual screen. And this was the economy class--imagine what first class may have been like. Now try flying United. Easter Island on a sunny day is one of the most photogenic places imaginable. 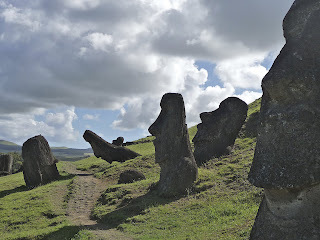 The stone Moai (statues) stand guard and cast interesting shadows and the hillsides are a gentle rolling green. We found a place to stay on the internet and it turned out to be great. It was a little house, owned by an American married to a Rapa Nuian (the island is known in Polynesian as Rapa Nui and the native people are, therefore, Rapa Nuians) and was fully equipped for independent living. It was located a 5 minute walk from the center of the only town so we shopped and cooked at home, saving us some expense, and, as it turned out amusingly the one night we did try to eat out, some aggravation. 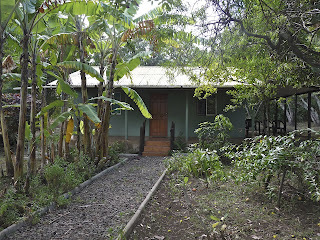 The yard provided us with avocados, mangoes and lemons and we collected guayaba on the trail, so we ate well. The yard also provided us some entertainment that proved to be fairly loud at night—it was a major highway for the wild dog population and home to some of the wild chickens and (more loudly) roosters. First, the statues command one’s attention. They do not, as one might imagine, stand guard looking out over the ocean. Rather, they were built with the spirits and likeness of a clan’s ancestors and look over the clan’s land—toward the center of the island in almost all cases. 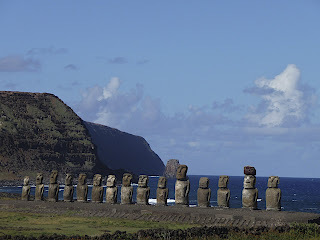 Because they are enormous, made of stone and hugely heavy, and because they were all carved at one quarry in the SE corner of the island but appear all along the coast, the first mystery of Easter Island is how the statues got where they are. One of the most outlandish theories is that they were carved by extraterrestrials and moved by some kind of space age technology. The more sober archaeological minds guess that they were dragged somehow from the quarry to their resting spots over long periods of time requiring lots and lots of people. The mythology of the native people is that the statues “walked” to their locations so they may have been moved upright, but most scholars think they were dragged face down on wood sleds or some such contrivance. How big are they? Average height is 4 meters and average weight is 12.5 metric tons. Some fell over in the delicate process of movement from the quarry to other parts of the island, and, if their necks broke when they fell, it was felt that the spirit of the ancestor left so the statue was no longer any good. Nearly 100 statues were found “on the road” toward their destination having fallen and broken, suggesting however they moved them, it was an imperfect process. But the carvings were truly awe inspiring even now centuries later. The faces definitely had personality (they were said to resemble the ancestor they were carved from) and presence, especially those we found still intact at the quarry. Another “mystery” about Easter Island is where the original inhabitants arrived from. With the successful voyage of Kontiki from South America to Easter Island, one theory was that natives of South America arrived by raft. The more accepted theory is that Rapa Nuians are Polynesian and that the island was populated as part of a wave of population from Tonga/Samoa through the Cook Islands, French Polynesia, Easter Island and ultimately New Zealand, all considered part of Polynesia. The evidence to support this is stronger—the stone carvings actually resemble those done in the Marquesas (and we saw the resemblance although those in the Marquesas are rarely as tall as a man), and, more compelling, when James Cook arrived during his Pacific explorations in the late 1700’s, he brought with him a Tahitian who was able to converse with the Rapa Nuians, suggesting a common language. 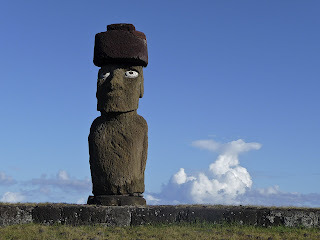 One of the most disturbing but fascinating pieces we read about Easter Island came from Jared Diamond’s book Collapse in which he described the island as the site of an ecologic disaster. Originally, according to the data he describes, the island had a native population of very large palm trees, in fact, the largest species known. Over the centuries of classic civilization on Easter Island (roughly 800-1680 AD), the trees were systematically deforested to provide for the lifestyle including the building of ocean going canoes for fishing and to provide the materials to move the statues (rope out of the bark and logs for support scaffolding), and possibly burned in funeral pyres. During this time, evidence would suggest a healthy diet including deep ocean fish, a peaceful coexistence with clans having split up the island like a pie and stone carvings being moved peacefully across clan territories and possibly cooperatively. Resources were plentiful, life was peaceful. According to the chapter, then, as resources gradually declined (the trees did not re-populate, canoes deteriorated, statues couldn’t be moved as easily, food became less and less easy to get), society also deteriorated devolving into competition, warfare and cannibalism. According to most theories about the island, when first seen and reported by Europeans, all the statues had been toppled, some while being transported, but most in situ statues were toppled by rival clans in warfare—this conflict period was short, only around 1680-1864, and population size plummeted from murder, starvation and disease as mentioned above. The island was also described as barren of trees by the first European explorers. The Ruttledge expedition’s cook in 1914 despaired about how he would be able to fuel their cooking fires. 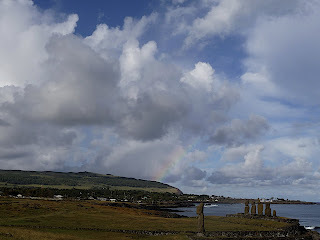 So one of the most interesting parts of the visit for us was the feeling that little existed of the spiritual connection with the heyday of the Rapa Nuian culture. In some areas, the statues have been re-erected as they were thought to have been done originally, but, since the necks of most of the statues were broken, their spiritual essence is no longer intact. During our 6 day there, we visited the various archaeological sites, often walking many miles to get there for the pleasure of it. The island is volcanic and the coastline is dramatic and beautiful. We took a tour with our American host who was very knowledgeable and then returned to some sites (such as the quarry) on our own in a rental car to take more pictures and explore further. We went to the beach one day (there are a couple very attractive white sand beaches and snorkeled at little (the weather wasn’t very cooperative the day we tried.) There were options to horse ride or scuba dive which we didn’t do, but we stayed pretty busy. 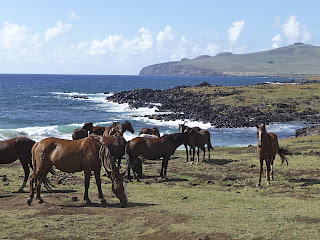 Other things we learned about contemporary Easter Island include the horse and dog problems. Dogs have proliferated horribly, and, while once there was a spay/neuter program, apparently someone wanted to do a natural rabies experiment and discourage sterilization and the program has not restarted. The dogs sometimes travel in packs which can become dangerous of course. Our experience with the dogs is that, as we like dogs, we generally are kind to them (short of feeding them) and one nearly always adopted us on our walks for the day, seeking “protection” of sorts by acting like our pet. One was with us for several days and we named her—a young shepherd like dog before her first heat (you always know because they immediately become pregnant with their first heat). She must have been pretty adept at “adopting” humans because she wasn’t terribly skinny and her coat still looked good. The horses too have proliferated and are wild but very tame. The locals do brand the new foals to claim them but then don’t do much as “owners” per se. The problem is that someone imported lupine, a wildflower that is poisonous to the horses but that they like to eat, so they are slowly being eliminated by poison. We saw a couple dead horses by the roadside. We started to refer to one road as “dead horse road” until we realized with our ongoing explorations that nearly every road could be named that, sadly. 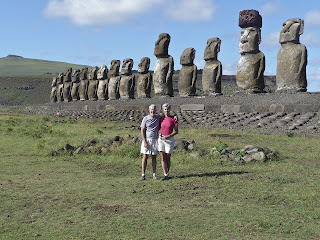 Tourism appears to be the major economic driver of Easter Island. Of course many people still live traditional subsistence lifestyles supplemented by mainland goods flown from Tahiti or Chili or shipped in by freighter every few months. We were told there are discussions about building a huge dock for cruise ships and to land Japanese fishing boats, both of which we think would be a mistake. The last night on the island, we decided to eat out. We chose a medium range restaurant (sort of comparable to US prices surprisingly), and sat down with the menu. When the waitress came back to take our order she told us what she had forgotten to tell us when we were seated which was that there was no fish tonight. None. How about chicken, we asked? No, no chicken either. Hmmm, this was fascinating as the island is overrun with chickens as we well knew, and is surrounded by ocean suggesting the possibility of fish being available (and they were on the menu). OK, we decided to try another restaurant and there, too, there was no fish. Must have been too rough that day to fish? Ultimately we found chicken curry that was satisfying and laughed our way home, glad we’d had a kitchen for most of our stay. During our stay there were several sailboats anchored in the main harbor, one just having arrived via Cape Horn. Also friends emailed us about a 110-foot sailboat that was suppose to “drop” by during our visit and sure enough one day it appeared, very majestic riding at anchor though it only was there one day before heading off. The anchorage there is adequate in “most” conditions, though when the winds change, boats go around to the opposite side of the island and anchor in the shadow of one of the largest ahu (platforms) with moai (statues) reconstructed until conditions allow a return to the city harbor side. We met cruisers out on tours of the island having left their boats comfortably riding at anchor. Though I must say when the conditions and swell changed direction the peaceful anchorage soon disappeared into a series of hobby horsing boats and they were quick to head for the opposite side and the lee. While the current Rapa Nuians may not have a knowledge of all their ancestors traditions, they are actively embracing their unique Polynesian culture. They represent 2/3 of the population of the island (out of about a total of 4000 people, the rest being Chilean) and they give performances of native dancing and music for the tourists. This was truly a fascinating place way off the beaten track and we’re glad we went.